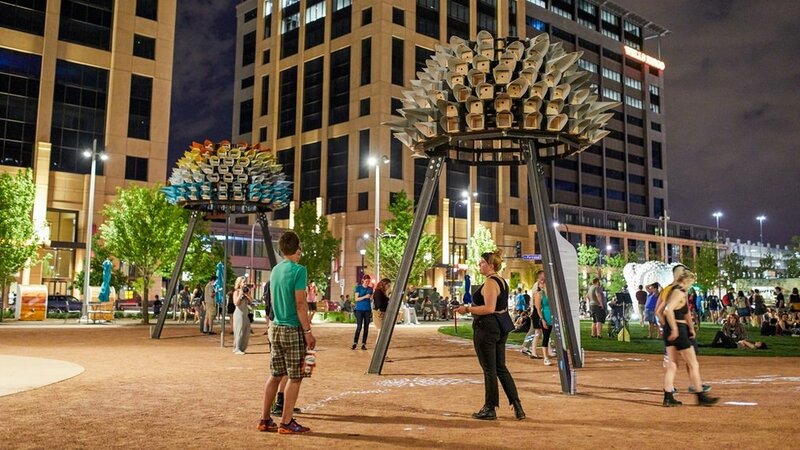 The Orbacles are a triad of spherical environments that connect visitors to the reality of climate change through the story of birds in Minnesota and the language of our senses. As both a record and a speculation about the future through the end of the century, Orbacles communicates the current and anticipated shift of birds due to species loss and migration related to climate effects. Orbacles is a physical visualization of the data scientists use to understand climate change. Each of the 147 bird species found in Minnesota in the Climate Change Bird Atlas is represented as a module – an individual birdhouse, feeder, or bath – with a hood that is sized to be proportional to the typical length and wingspan of the species. The placement is consistent, so one finds the module for each species at a consistent location within each Orbacle. By 2100 the world will have changed in ways that are hard to imagine. Scientists often compare multiple alternatives, since the future depends in part on the choices we make today. The future scenarios represented in Orbacles come from the Special Report on Emissions Scenarios, developed by the Intergovernmental Panel on Climate Change. Over half of Minnesota’s birds are threatened by climate change. Orbacles attempts to visualize and make legible this threat. Orbacle A|Shelter represents a baseline for comparison, with one shelter for each of the 147 bird bird species prevalent in Minnesota today. Offering two possible futures, Orbacle B|Feeder showcases a low emissions scenario and Orbacle C|Bath showcases a high emissions scenario.To “read” the data and compare the different scenarios, look for changes in color compared to Orbacle A. Blue means the species become more prevalent in the future; Orange means that the species are expected to become less prevalent in the future. This project was awarded to the team through the Minneapolis sponsored Creative City Challenge Competition. The installation occupied the Commons park for 3 months during the summer and fall. The award was $50,000 to construct the installation. The design team raised another $75,000 so that the project could be built in its entirety. The sculpture was largely built and installed by the design team with help of Local fabricator. The project showcases the possibility for interdisciplinary collaborations and expands the role of the landscape architect into the medium of installation. The installation expands the field of methods used to communicate this scientific information and the public urgency around climate change to the public. Rather than narrowing understanding to singular topics, Orbacles intends to spur recognition, contemplation, questioning, conversation, and response to the dynamic atmospheres already present in the site and throughout Minnesota.